The Anti-Fascist Network is supporting New York City Antifa‘s call for an international day of solidarity with anti-fascist prisoners. The July 25 International Day of Solidarity with Antifascist Prisoners originated in 2014 as a Day of Solidarity with Jock Palfreeman, an Australian who is imprisoned in Bulgaria for defending two Romani men from an attack by fascist football hooligans. Groups around the world took action: holding demonstrations, benefits supporting the Bulgarian Prisoners Association, writing to Jock, and talking about the plight of the Romani and Sinti people in general. In 2015 we would like to expand this day of solidarity to all antifascist prisoners around the world. We encourage groups to take the day to plan an event of their choice—whether it is a letter writing, demonstration, benefit, or other action—and to focus on the prisoners and related issues that are of most importance to them locally. 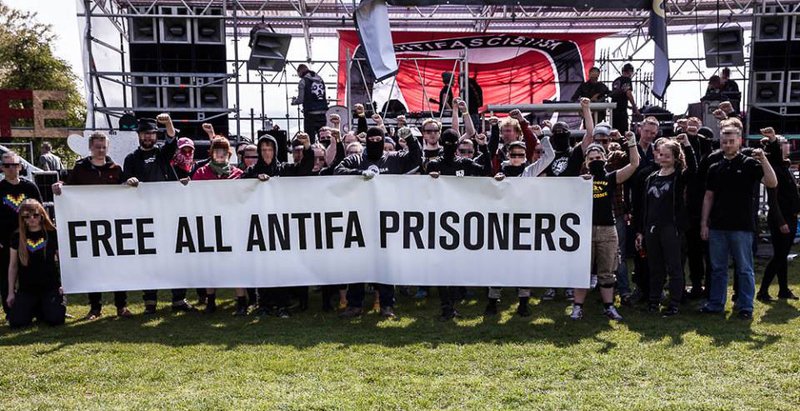 Below is a list of global antifascist prisoners; if there is an antifa prisoner who is missing, please e-mail us with his or her details and the language(s) they can read. Many cities will be holding events and actions, which include New York City, Philadelphia, La Puente, California, Chicago, and Denver (US); Sydney (Australia); Helsinki and Tampere (Finland); as well as events in the United Kingdom, Bulgaria, and lots of other places! [Update 7/12]Roman Bogdan was arrested on April 15, 2015, as part of the long-going state repression of anti-fascists in Brest, stemming from a fight between anti-fascists and fascists on May 8, 2013. Roman is facing up to ten years in prison on charges of aggravated bodily harm. Dzmitry Stsyashenka was arrested on October 4, 2013, for his alleged involvement in a fight between antifascists and neo-Nazis in Brest on May 8, 2013, that sent one Nazi to the hospital. He is also accused of another fight with neo-Nazis during the summer of 2013. He was sentenced to four years in prison, but in 2014 his term was reduced by one year due to an amnesty. Dzmitry Zvan’ko was arrested for his alleged involvement in a fight between anti-fascists and neo-Nazis in Brest on May 8, 2013, that sent one Nazi to the hospital. He was arrested the next day, along with four other people, in a police raid on the homes of known anti-fascists. Dzmitry filed a complaint to the prosecutor about psychological and physical abuse while in custody. He was accused of malicious group hooliganism and serious bodily assault and faced up to ten years of prison. Dzmitry was found guilty and sentenced to five years of prison, but after paying off about 4,000 euro in damages he was granted amnesty, which has reduced his term by one year. Please note that Aleksandr is currently being moved to a different prison in Rostov. We are waiting to confirm his new address. Joel has over 4080 USD in fines, and his supporters are asking for help raising the money. The group can be contacted at the web site below. Linus Soinjoki was charged and convicted for actions related to his involvement in the anti-fascist movement in Sweden. He was given fourteen months in prison and began serving his sentence in mid-May 2015. Linus can read Swedish and English. [Update 7/12]We have received news that Linus would rather people contact a Swedish Antifa support page, Föreningen fånggruppen, for his address if people are interested in writing to him. Jason Hammond accepted a non-cooperating guilty plea and was sentenced to forty-one months on January 2015 for his part in an organized direct action taken against a group of white supremacists. In 2012, a group of racists and white supremacists organized a White Nationalist Economic Summit in the Chicago suburb of Tinley Park. Groups of anti-fascists and anti-racists from the Midwest confronted the meeting and successfully shut down the event through a righteous melee. In the aftermath, five antifascists were arrested, and dubbed the Tinley Park 5. The five were sentenced to upwards of three years and all have since been released. Jason was arrested later, and is the last person still in jail for this action.